From the book: History of the Presbyterian Church of Wysox, Pennsylvania 1791 - 1936 by Victor Charles Detty, Pastor. pp. 184-189. Copyright, 1937 by Victor C. Detty. Jane Strope travelled this path in her lifetime. The following narrative was made available by Mrs. Mildred Rahm Smith, whose late husband, Mr. Edward L. Smith, of Towanda, PA., was a lineal descendant of Sebastian Strope and also of Jonas Smith, early members of the Wysox Church. The paper was secured through the courtesy of Katherine Scott Hills, another descendant of Sebastian Strope, and she made the following note: "Mrs. Jane Whittaker's Narration, taken by Judge C. P. Avery of Owego, previous to her death in 1852. A copy of the original manuscript was made in 1878 by Mrs. J. E. Fox of Brooklyn, N. Y., from which this was copied." The aged lady, Mrs. Whittaker, who gave me the following narrative, went West in the Autumn of 1850 with her son Oliver Whittaker, and is now living in Toulon, Stark County, Ill. with him. He is a gentleman of ample means and is doing all that lies in his power, as a correct man and dutiful son, to make cheerful the declining years of his venerable mother. (Note: Mrs. Whittaker died at Toulon July 6th, 1852 after a short illness; had been for 37 years a member of the Methodist church.) Her narrative has never been printed and I believe this is the first time it has been given in a public manner. "My father and mother with their family, myself being of the number, settled at Wysox, then called Wysocton, in Bradford Co., Pa., just below Towanda on the other side of the river, five years before the Massacre at Wyoming (See deed &c. That would bring it in 1773). We moved from Catskill, my mother and her six children, including myself, were made captives by the Indians on the 20th day of May, previous to the Massacre (1778). My grandparents (Mr. and Mrs. Van Valkenburgh) who had come with my father from Catskill, were also captured. The capture was in the morning. We were all at breakfast. The Indians numbered thirteen, with three squaws in their company. I think they were Senecas. They came from Genesee. They took us at once to Tioga Point. There they gave us as prisoners to the English under Butler. "We were at Tioga Point when they returned from the Wyoming Massacre with their booty. I was about eleven years old at that time. We knew when the expedition started that it was fitted out for Wyoming. Among their booty were cattle and horses in great numbers. I heard them say that some of the cattle &c. tumbled off from Breakneck hill and were killed. While at Tioga we picked our living from the fields and woods, strawberries and raspberries and later in the season, blackberries. "The Indians did not abuse us except that they gave us no bread or salt. The Indians and other forces and all the prisoners, including myself, went up the Susquehanna to Bainbridge, and some went to Unadilla, which the Indians called Teunadilla. This was in the latter part of the summer or perhaps in July. We were in that vicinity several weeks. We went up in canoes, encamped the first night near the mouth of the Owego Creek, which the Indians pronounces Ah-Waghgha. At Bainbridge and Teunadilla we had the privilege of cooking by a fireplace, a novel luxury to us since we were captives. Bushes were stuck up and wove together at the top to make something like a tent to protect us. This the Indians helped us do, in which they were very skillful. We had eels and fish in abundance at these places. While we were there, two British soldiers deserted, making their way in the direction of Tioga Point, by the Way of Owego. "The two deserters having got as far as this point, were overtaken, the forms of court martial dispensed with and they were shot down at once. Their bodies were left on the top of the ground as not entitled to burial. Queen Esther of Sheshequin superintended the digging of a grave for their bodies and they were buried after the manner of the Indians. Mrs. Whittaker continued, "It was a foot path well beaten and quite wide enough in many places for two abreast." After reaching the lake, part of the company went by land and part by water to Fort Niagara." As to their treatment by the squaws Mrs. Whittaker says, "They did not regard us much more than if we had been four footed animals. Sometimes they would come around and look at us and grin after the manner of the Indian but make no remark." "Carts, wagons and all kinds of vehicles were gotten together at Whitehall to help the returned captives to their homes. "From Whitehall we went to Albany." (When Mrs. Whittaker and her relatives were approaching Saratoga, an incident occurred , her meeting with her father, for whom they had mourned as among the slain at Wyoming, which renders it necessary to allude to the original capture at Wysox.) "The night before the capture which was May 20, 1778, an Indian sought the shelter of my father's house and remained there all night. Her father being on friendly terms with them generally the Indians often did so. In conversation however, during the evening with him, my father satisfied himself that the settlements were to be molested. "The Indian left in the morning after having been very kindly treated, but my father had become so alarmed that he saddled his horse immediately to go to Wyoming to procure a sufficient guard to aid him in escorting his family and relatives to a place which at that time appeared to be a place of safety. "It being understood throughout the state that 300 prisoners were coming via Skeensborough, my father made his way to Albany for the purpose of ascertaining whether his family might not possibly be among the returned captives. On examining the exchange list he found our names. He pushed on at once to Saratoga and a few miles beyond that point met them all." "I was married some three years after we got back to Wysox and then my husband and I removed to Owego. "My maiden name was Jane Strope. "My father was Sebastian Strope. (My mother Lydia VanValkenburgh Strope.) My first husband, with whom I came to Owego was Jeremiah White. My second husband's name was Gideon Whittaker. "When I first came to Owego, soon after my first marriage, we settled at a place near where the families of Ephraim Leach and his brother now live. At that time there was an old log house near the bank of the Susquehanna River in the lower part of the present village which surveyors had occupied. Esq. McMaster first came on with his family." "While we were captives on the Susquehanna, a man by the name of John Secord, a Tory, had some flour which had been brought from Niagara and he was dealing it out to one and another of the company, and my mother went to him and begged for some for her children who were almost starving. He refused to let her have any. His son Cyrus who was standing by, said 'She is not to be blamed for her husband's being a rebel,' but he steadily refused to give her a morsel. The son however, gave some to my mother without his knowing it. After the war, this same Secord and his son Cyrus came from Niagara to Wysox to settle but he did not stay long. My father heard he thought of settling on Franklin Flats and he went to him with a heavy ox ship and said 'John Secord, do you suppose we are going to have you among us when you refused to let my wife have flour for her starving children,' and followed that up with a terrible whipping. He left the settlement, but my father also told him before he left, if his son Cyrus would come he would be glad to have him for a neighbor and would do all for him that one neighbor should do for another. "When we were brought to Tioga Point as captives, we found the flats along the river at that place and Owego cleared and corn raised. The stumps from many of the flats off. Strawberries were wonderfully abundant. 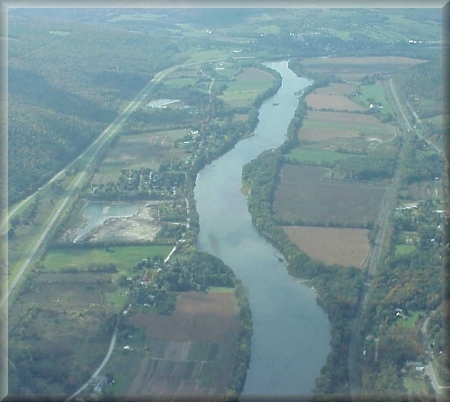 "Queen Esther's plantation, as it was called, was on the West side of the Susquehanna, extending above and below the junction of the Chemung on its West side." Mrs. Whittaker said the Indians pronounced the river Susquehawna, Wysox they called Wysockton--Tioga, Tow-e-o-gah. Towanda, Tawn dow. Chemung, Cheumak, Niagara, Oh taw-ga-rah, Owego--Aw-waw-gah. "There was a squaw by the name of Chemnak, who lived up the Chemung, from whom I understood the river was named. She was called a Queen and Queen Esther called her sister, on a visit which both made to my father." (I mentioned to her what Red Jacket said of the origin of this name [Shemung]). She said she had often heard of this horn but not as connected with the name of the river. I may mention here the same horn was at an early day sent to the British museum by one of the Colonial Governors, as a great curiosity. It measured some 14 feet in height. It was a single horn from one side of an Elk's head.) "The squaws did not paint their faces. They never appeared disposed to harm us. They always kept on their side of the fire, and we on ours. "When my first husband died in 1805, Humphery Avery helped and befriended me in settling his estate, as also did Judge Wills. My husband left no will, having died suddenly of an accident by getting his leg crushed in a Grist Mill near where the late Deacon Jones used to live.